PRODUCT: 1" DIAMETER TRAK-IT / TRAKFAST DISC LATHING WASHERS. 1000/BOX. PRICE/BOX. 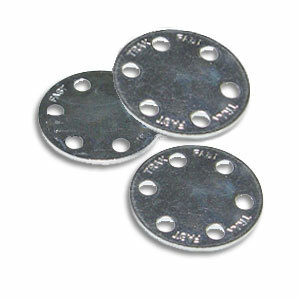 DESCRIPTION: 1 inch diameter perforated plated steel lathing washers. Used with the magnetic nose piece in Ramset Trakfast and Powers Trak-It tools. Plated Metal Washer (1"). Provides a wide holding area for fastening metal lath, waterproofing membrane, etc. to concrete / masonry. Washers quickly snap onto the Magnetic Nose Piece (above). Pins are then shot through the washers.